The anxiety in Europe has been slowly building. Last week the lid blew off. • Many stock markets have been teetering. • The strategy for implementing Brexit remains confusing and unresolved. • The popularity of anti-establishment politicians running in upcoming elections in Germany, France, and the Netherlands is growing. And then last week the snowflake landed that pushed investors over the edge… President Trump signed an executive order to withdraw the US from the Trans-Pacific Partnership with 11 other nations. Right or wrong, many Europeans feel this will impact economic growth in their region. And if growth slows, their economies will be in even greater trouble than they already are. This pushed investors to a tipping point, and anxiety spiked. Guess what they did in response? That’s not a typo in the chart. 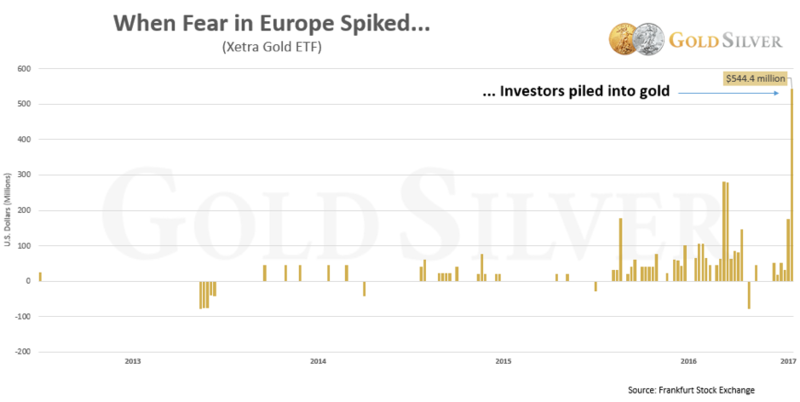 In just one week, one gold ETF in Europe saw inflows of over half a billion dollars. It was the fund’s biggest weekly inflow in 5 years. It was more than 10 times the amount GLD received in the same week. You can see that for at least 3 years buying was subdued, and for many weeks there were no purchases at all. Last year saw a noticeable increase, but it wasn’t until last week when inflows exploded. This is just one of four gold ETFs in Europe. They all saw huge spikes in volume (Xetra-Gold was the biggest; it’s Germany’s GLD, so to speak). London, too, saw a lot of investors pile into gold ETFs. • When fear grows, investors seek gold. This altruism seems obvious. But it shows that the next time fear spikes here, we can expect a similar reaction to what Europe has seen. And if you think a series of events is coming that will instill great uncertainty, confusion, worry, and maybe even panic in your fellow citizens, then you can expect to see an equally corresponding rush into gold. You don’t need me to tell you what that kind of environment could do to the price. For those already invested, you’ll benefit mightily when that transition takes place. Everyone here at GoldSilver is convinced that one of these days, not too far off, many of Mike’s predictions will begin to unfold. That’s why we continue to buy physical gold and silver now. We encourage you to not put it off—you don’t want to be scrambling to buy bullion at the same time everyone else is. The chart above shows that for the most part, the interest in gold was sudden—once a spike like that grabs hold, you’ll have to scurry to locate product, and will end up overpaying for it, all the while kicking yourself for putting it off. • Our brand new 2017 silver Pegasus round is now available. It’s by far our most popular round, and the low premium makes it much more affordable than a silver Eagle. Mike and I both just bought some. It’s not logical to think that with all the risks in the financial system today, fear won’t spike again soon. When it inevitably does, investors will turn to gold, just like they’re doing in Europe now. Make sure you’re ready by owning a meaningful amount of physical gold and silver.